Check out my video breakdown of Ole Miss wide receiver A.J. Brown. Examining Ole Miss WR AJ Brown’s fit as a flanker for the 49ers. Good work, Grant. After nailing a 6.89 in his 3-Cone, A. J. Brown will be the target by moving up with the Colts at #26 by using our #36+#104. Snatching him out from under the feet of the Ray-duh’s, and Lynch solidifies himself as Gruden’s draft day nemesis…. As much as I would like the 9ers to get AJ, losing more draft capitol would be hard to swallow. It’s not like they’re a piece or two away from the Super Bowl. Even if it ruined Gruden’s night. Think of it as an investment in Jimmy’s success, and health. Trading up into the first only becomes ok if they trade down with the first pick and gain several additional selections. Even then I think there is enough similar talent not to warrant a trade up. Colts #26 is valued at 700. 49ers #36+#106 is valued at 626. Throw in next years 5th, but if not; cough up our 3rd valued at 255 and our #36 valued at 540 for the Ravens #22 valued at 780, and their #160 valued at 27. Good detail work Grant, keep it up!! A.J Brown just ran a 4.49 sec 40 and 6.89 3 cone. He has good moves, great hands, strong, plenty of good video, probably puts him in the low #20’s. For SF to get him around #22-23 before the Raiders at #24, they’d need to move up too, like using #36 + #67 which equals #22 pick TVC. Not sure SF would use their 2nd and 3rd rd picks with only 6 total picks unless they trade down. That’s it !! !..now they for sure trade down their #2 with Gruden and get Allen with #4 and A.J. Brown with #24 or #27, saving their 2nd/3rd rd picks!..Then trade down from #36(2nd rd) with the Redskins for their #46(2nd rd) and #96(3rd rd) just 10 spots lower and picking up another 3rd rd pick. At #46 there’s CB Trayvon Mullen, at #67 S Johnathan Abram, at #96 OG Connor McGovern. Then 2 4th rd picks SF’s #104, and #106 from the Raiders trade down. Then 2 6th rd picks for a total of 9. Really good stuff Grant! I like AJ Brown a lot. I’m keeping an eye on another prospect as well. The 2018 Citrus Bowl MVP – Notre Dame’s Miles Boykin, who seems to be seems to be an ascending talent who is really coming into his own. He’s a big kid who is an absolute freak athletically, and his performance at this year’s combine was epic! He ran a 4.42 40 yard dash. And then he absolutely jumped through the fricken roof at Lucas Oil Stadium, with a vertical jump of 43.5″, which was the best vertical of all WR’s and 2nd best among all groups (the only player to jump higher was the Safety out of Virginia -Juan Thornhill, who bested Boykin by only a 1/2″) Boykin followed that up with a broad jump of 140″, which led all WR’s. He recorded the fastest 3-cone drill with a scorching time of 6.77 seconds, and the 3rd fastest time in the short shuttle @ 7.04 seconds. He needs to learn how to counter press jabs with his hands, but this should be less of an issue at Flanker. I project Miles Boykin as a mid 3rd – mid 4th round pick. I like him here for the 49ers! Hasn’t learned to counter press jams with his hands. Allows press corners to grind on him. Stride length limits burst out of the top of his route. Needs to finish his in-breaking routes. Cornerbacks are allowed to crowd his chest. Needs more aggressiveness and play strength. Catch focus runs hot and cold. Limited yardage after catch on levels one and two. There is a reason why he is ranked 136, and 16 other WRs are ranked ahead of him. Still, he has a late 4th, early 5th round ranking, so the Niners may want to take him in the 4th, since they have no 5th round pick. I have been patiently waiting on the stats for Miles Boykin….either I have been misled by his size and stats, or a lot of folks on here have been willing to miss the boat on him. If he is still on the board in the third round, I will be surprised….It’s only dreaming to see Hakeem Butler and Boykin on the field at the same time from the 50 on into the Red Zone…Oh, and add Kittles to that mess…Throw it high Jimmy…throw it high…. Seb, I mentioned his need to improve against press coverage. That’s one reason he is a particularly good fit at Flanker, IMO. +1 OREGONINER, you could be right. I really noticed Boykins too since the combine. At 6’4,’ good size, runs a 4.4, super quick 3 cone/ss plus jumps a mile high, he’d be a great red zone WR. The new coaches can bring him up to speed on press jams, allowing CB’s to crowd him, route adjustments and being more aggressive. Maybe take him in the 4th with their 104 or from trade down picks near there..
RND 1) Edge – Nick Bosa, Ohio State – 6’4″ 266 lbs. I agree with the “experts” here, as Nick is currently my top ranked prospect in this entire draft class. This pick is a no-brainer for me, and I think Niner fans should be thanking their lucky stars if the Cardinals do in fact end up drafting the undersized, but dynamic QB Kyler Murray at the top of the draft, because Nick Bosa is about as close to a sure thing as you will ever see in a draft prospect, IMO, and he is ready to step in on day one opposite the newly acquired Dee Ford, instantly giving the 49ers one of the best, if not the best front 7’s in the NFL. RND 2) S – Chauncey Gardner-Johnson, FL – 5’11” 210 lbs. I wanted the 49ers to sign Earl Thomas, but I would have been hesitant to give him the type of contract he got from the Ravens. As much as I like the kid from Delaware, Nasir Adderley, I’m giving the edge to Gardner-Johnson, and I’d be ecstatic if the 49ers ended up drafting Gardner-Johnson after missing out on Thomas. Chauncey can handle zone duties or play man on big receivers and tight ends, but it’s his range, ball-tracking skills, and his ability to take it away over the top, which make him a perfect fit for Saleh’s cover-1 high safety scheme. It’s an added bonus that he’s one of my favorite all-around Safeties in this entire draft. I’d be surprised if he lasted much past #34, if he doesn’t go sooner, so I’d like the 49ers to take him here. RND 3) CB – Rock Ya-Sin, Temple – 6’0″ 193 lbs. CB is still a position of need for this team, and perhaps the icing on the cake for this young defense. I love the Jason Verrett signing, but we all know he simply hasn’t been able to stay healthy. Well, there is a good reason this two-time state champion wrestler – Abdurrahman Ya-Sin was given the nickname “Rock”. He is, pound for pound, the strongest, most physically intimidating CB in this draft class, bar none. After originally signing on with FCS program Presbyterian College, and earning first-team All-Big South honors as a Sophomore, he transferred to Temple U for the 2018 season and immediately showed he had the talent to excel at the FBS level. Ya-Sin was named first-team All-American Athletic Conference as a Senior. Sure, he has but 1 year of FBS experience, but he has everything Robert Saleh looks for in a CB, and I’d love to see Uncle Sherm take him under his wing to help him reach his full potential. He has the physical traits to excel in both man and zone coverage, as he is both physically imposing as well as light in his backpedal, with the loose hips and quick footwork required for extended mirroring of a receiver off of their release. He is currently ranked 58th on my board, so the 49ers may have a golden opportunity to and him in round 3. RND 4) WR – Miles Boykin, ND – 6’4″ 220 lbs. *See my write up on Boykin above. RND 6) OG/OT – Keaton Sutherland, Texas A&M – 6′5” 315 lbs. He’s my 2019 “sleeper” prospect. The versatile Sutherland was not on my radar until he turned heads during the East/West Shrine week. He followed up his Shrine week with an impressive pro day for A&M. He shows very good movement skills for a man of his size, and his 36″ vertical at his pro day would have been the best vertical of all OL at the combine. He’s well suited for Kyle’s outside zone scheme IMO, and his versatility to play both OG and OT (he played RG, LG, and RT for A&M) would be added value, making him a great addition this late in the draft. +1 Craig…. they should have a fast high flying 6’4″ WR. Hey 49reasons, before I get onto Boykin, just want to say I think 49er fans should just get comfortable with the idea the team will take a WR no later than the 2nd round. Trying to find later round value guys is fine too, they may double dip, but very high chance the team will be getting a WR early that is ready to start. On Boykin, he is exactly the type of player I typically try and avoid. Those big guys that are excellent height, weight, speed players but don’t translate that to film. Boykin doesn’t play as big or as fast as he tested. For such a big guy he lets DBs make plays on the ball too easily, and gets bullied in his routes. For such a fast and agile guy (especially at his size) he doesn’t do a good job of getting open. He’s the type of player that I see fans fall in love with all the time due to his athletic traits that goes onto obscurity in the NFL because he just isn’t a particularly good footballer. As a late round flyer I don’t mind taking a stab that maybe he can be coached up, but 3rd/4th round is too high for me. If you are after a late round height, weight, speed WR prospect with upside, draft Jalen Hurd. He’s the type of player I bet on. He’s gotten some bad press for how things went down with the Vols, but from everything I have read it sounds like you won’t find a guy more determined and hard working. And he is a plus athlete and football player, that provides excellent versatility. Yea, I’d have to agree on Boykin. We’re taking our wide out with the 2nd pick anyway. I’m certainly not opposed to the 49ers taking another WR as early as the 2nd round Scooter, I’m just doubtful that they will. Of course, some of it depends on how the draft shakes out. Kyle is confident in his ability to scheme his WR’s open, and I’m doubtful they will target another WR in round 2, unless of course there is a wideout whom they are crazy about, and clearly see as the BPA @ #34. I’m not saying Boykin is the best WR prospect in this class. But when I consider the 49ers need, and draft value, Boykin seems to hit the sweet spot for me, considering who the 49ers currently have on their roster. 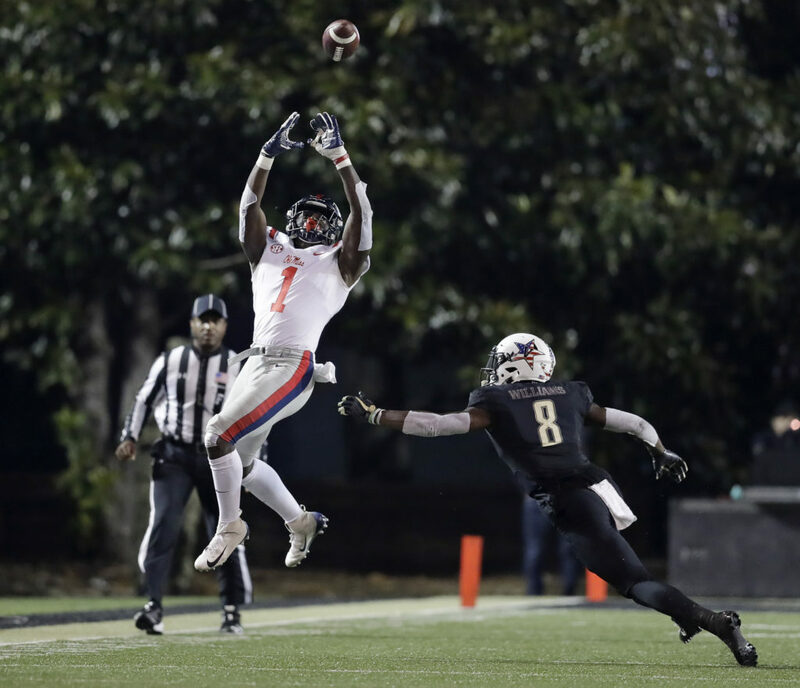 I like AJ Brown a lot, but it seems to me that the one thing the Kyle and Jimmy are missing in their current group of WR’s, is a guy who can both go up and high point the football and win those contested catches in the red zone, and run by the defender on the deep routes. Boykin can do that day 1, and he also has the size and physicality to handle those crossing routes. I particularly like Boykin because I think his ceiling is through the roof. He will fill a big need in is rookie season, but he’s got that classic speed/size/weight triangle every teams covets in a #1 WR, a la Julio Jones, and the ability to devlop into that kind of WR. So, to get a guy like that in the 4th round, that’s a home run for me. I could be wrong, but if there is one position I feel confident in my ability to evaluate, it’s WR. If you don’t mind me tooting my own horn …. my track record when it comes to evaluating WR’s has always been on point, and especially spot on as of late. I was as high on OBJ as anyone back in 2014, and ecstatic when I heard he was supposedly the 49ers round 1 target. I was also down on Kelvin Benjamin that same year. I was raving about Stefon Diggs in 2015 when everyone else seemed to think he was too small to operate outside the numbers. Michael Thomas was my 2016 draft crush whom I mocked to the 49ers on this blog – in round 2, 2016. JuJu Smith-Schuster was my guy in 2017, although I was hoping he fall to the Niners in round 3 (I had him mocked to the Niners in round 3, but he ended up going late round 2). I was also big on Corey Davis who reminds me a lot of the GOAT, #80, although there will never be another Jerry Rice. I was also a huge Cooper Kupp guy, even though I rarely get excited for “slot” receivers. If I had to pick 2 WR’s who aren’t getting enough love this year, it’s another Buckeye WR – Paris Campbell, and the Notre Dame product – Miles Boykin. I’m down on Kareem Butler, because I think his route running is extremely clunky, and I don’t think it’s an issue he can fix. Butler is a really, really big, physically imposing WR, with great YAC ability, but I think his inability to get in and out of his breaks will always hold him back. I think AJ Brown is a very safe pick in round 2. And yes, I do like DK Metcalf, but I think he’s a classic boom or bust prospect, so I would be hesitant to take him as high as he will likely be drafted. There you go, you can hold me to it Scooter, lol. *correction – I think Kareem Butler’s clunky route running is an issue he cannot fix. I see Boykin like another ND WR, Equanimeous St Brown, who is 6′ 5″ 215 lbs, and caught 21 passes for the Packers for 328 yards, a 5.0 average and no TDs. Oops, Hakeem Butler. Thanks Seb. Looks good! Realistically can we grab him? What do you make of the trade scenario the Giants negated for OBJ? Did we do the right thing? No brainer. If he’s available at #36 he will be a 49er. I think they will try and trade up to get him. I think Samuel will be the fall back plan. O-line takes precedent over a slot receiver. That is why trading back is so important. They should get both an O Lineman and WR in the second round. Wrong, trading back is a bad idea for a team lacking elite talent. Right. Trading back is smart if they can trade back, garner more picks, and still get the player they covet. With Oliver in the mix, the Niners could trade back, get that additional second round pick, and still get Bosa. Bet you would be happy with that. Not gonna happen. We will stay put and draft Bosa. We can get good players next year when we’ll be drafting in the 20’s. This year should be about adding the very best this draft has to offer with each pick, and especially at 2…. I wouldn’t be surprised at all if they traded back from #2. In fact I still suspect they hope to. Scooter, if Bosa is on the board, they will take him. I do not anticipate another team offering enough value to give him up…. Scooter, did you also see where Maiocco believes Staley will play 2 more seasons? That means we’re not drafting another OL until round 6, would be my guess…. When have you ever been right ?All your mumbo jumbo evaluations end up being dead wrong !JxckXass! He will not be available at the 32nd, because the Niners pick at 36., He is ranked at 34 on the CBS big board, but I see him mocked much earlier. N’Keal Harry would be a perfectly fine alternative, and they get to keep all their picks.If they do bundle picks to move up, then they would have only 5 selections. Harry’s 3-Cone 7.02 falls short of what Shanny likes at the position. I’m not saying he’d pass on him, but I guarantee he’s not at the top of his list…. Harry had 27 reps, while Brown had 19 reps. He is only 4/100th of a second slower than Brown. Harry is called a junkyard dog who is willing to scrap as a blocker. Harry goes #42-45 -2nd round. Since AJ Brown is long gone before the end of the first round, Harry would be available at 36. * Doug Farrar of Touchdown Wire projects WR N’Keal Harry going to the G.B. packers at pick #30. * Luke Easterling of DraftWire projects N’Keal Harry going to the Indy. Colts at pick #32.
by Carolina Panthers at pick # 16.
wasn’t a major factor in red zone. * Personally, I think you’re right at #42-45 2nd Rd., even late 2nd Rd. Kyle prefers WR’s who have the ability to gain “instant” separation, because it’s vital to his scheme. He’s on the record saying as much. And that’s why he tends to go with smaller players at most of the offensive skill positions. This is the main reason I don’t see them targeting Hakeen Butler. I’ve been saying for the last couple years that the 49ers need to find a WR who is both quick at gaining separation, and who can also go up and win those contested catches. If there is one area that needs work, it’s redzone efficiency. When was the last time they connected on an endzone fade route, for crying out loud? I still think FS is clearly a bigger need than WR right now, especially after they picked up Jordan Matthews. So why not go with a FS who fits their scheme early, and take a WR whom they feel like can be a redzone match up nightmare as early as this season, with the potential to develop into a #1 WR over the next couple years? Again, some of it does depend on how this draft falls for them. I am always a proponent of going BPA early, unless it’s clearly at a position where they already have an abundance of talent, i.e. the interior of their DL. One reason I think DK Metcalf has a chance to be special, and reach the lofty heigths of his potential, is because he is not just a fast, big bodied receiver. He’s also a quick-twitch athlete with loose hips and quick feet, which allows him to get in and out of his breaks as quickly and efficiently as you tend to associate with much smaller WR’s. When you consider this trait, along with his rare size, speed, and ability to box out or high point the football and win every contested catch imaginable, he looks to be in a class of his own. Unfortunately, unless the 49ers are offered a trade back deal too good to pass up, or they trade back more than once in round 1, DK Metcalf probably doesn’t make sense for them, IMO. Unless the Cardinals surprise us and take Bosa at the top of the draft, he’s going to be the pick for the Niners at #2, and you can bet the house on that! I think that’s what it comes down to. FS or WR. Both Ward and Matthews are stop gaps. Juan Thornhill or AJ Brown. I’d probably go Brown if he’s there, and if not Thornhill. Verrett is another stop gap at CB in a weak draft class. Seems like they might go UDFA there. That is why this draft is so important. The Niners need to be building for the future, and locking up as many players into rookie contracts will help build for that future. That is also why I want to trade back, to get more than 6 selections. The rebuild playbook clearly states that year 3 is when your team should be ready to add elite talent to fill out the roster, instead of adding a bunch of very good players. Edge rusher need meets elite talent Bosa Round 1, Flanker and FS whichever represents more value with the players available Round 2, Flanker or FS whichever you didn’t fill in round 2, Round 3. Would be a draft dream for me. Round 4 looks like LB. Rounds 6 looks like a TE and OL. +1 Razor. And I could definitely get on board with those first 3 picks! Shanahan needs to his offense on all cylinders. Grant, thanks for the breakdown. I’ve been neglecting pick 36, despite obsessing over picks in the 30-31 range five years ago. Thanks for the breakdown Grant. I will be ecstatic if we get AJ Brown for our pick 36, but don’t see him lasting beyond the Patriots at 32. Deebo Samuel is the next best thing, but he is injured a lot. With the Flanker position, you need someone tough to get those contested catches. I’ve got a feeling Shanny has a plan involving a move up from #36 to go get Brown somewhere in the 1st round. The knuckles will start to get white as pick #20 comes around, and whiter still with each successive pick. He’s gonna come off the board somewhere between 20-32, and it will be a tough call as to when you’ll need to Make The Move…. Lynch has got his hands burnt moving up for players – Foster, Joe Williams etc. I would be wary of moving up Razor. This team does not have enough draft ammunition to move up, unless they can trade down from the 2nd overall pick. No thanks on Hollywood Brown. Superfluous for the 49ers anyway. If they miss out on AJ, Deebo will be the pick. If they miss out on both, someone like Harmon has probably fallen and he may be the pick, though I am not convinced he is exactly what Shanahan is after at Z. If they are all gone, Ridley might be the guy, but not at #36. I highly doubt Harry will be their guy. Just doesn’t do what Shanahan wants – he needs to be schemed the ball. I agree. No thanks on Hollywood Brown! They either go all out for AJ Brown, or they try and stand pat for Deebo which will be a risk because of his injury history. But they will definitely get a WR with the Draft. I’d rather have Ridley over Samuel, so instead of trading down from an elite player at #2, why don’t we trade down from #36 and grab Ridley if AJ is gone? 1. It isn’t about who we like, it’s about who Shanahan likes. And it is hard to ignore that Shanny has a type at WR. Part of that type is agility. Ridley didn’t test particularly well. I think Shanny will have two WRs he really likes in this draft, and those will be Brown and Samuel. With Brown the clear favourite. 2. I don’t think Shanny will feel as compelled to add Bosa as you do. They’ve added Ford, and he will play the premier edge position on the team. He’s the main guy they are banking on to improve the pass rush. Not whoever they draft. While I very much expect them to add another edge early, I would not be surprised in the slightest if it is after a trade back. Or if after such a trade back, they took a WR (say, Brown) before an edge. Shanny wants to get his offense singing this season. I am of the opinion he believes there is only one key missing piece to make that happen. He will add the WR the wants. Harry’s 3-cone time is faster than Samuel’s. While I don’t doubt Shanny will identify the WR he wants, and do what it takes to secure him, I take issue with your reasoning regarding his feelings towards Bosa. From his statements recently, he expressed the importance of having two edge rushers, and the problems they present for an offense. Freeney, Mathis, Seahawks yearly fortification at the position, plus Maiocco feels that Bosa will be the 49ers selection if the Cardinals do not take him first…. Where did I say they won’t want a 2nd good edge rusher? I explicitly said they will still take one high. I am just not convinced they will feel the need to take Bosa at #2. There are a lot of good edge rushers this year. Maiocco said it will be Bosa at #2 if they stay at #2. Right, and if the Cardinals take Murray there isn’t a quarterback worth trading up for. That caps the draft capital, which means the 49ers will not get a good enough offer to pass on a player they clearly covet. There’s a gaping hole waiting for Bosa to fill, and he happens to be the yang to Ford’s yin…. Maybe, maybe not. Teams do crazy things for QBs. Trading back from #2 is what I expect the 49ers are hoping for. If they can’t get a decent trade offer, then sure, most likely will be Bosa. Barely. And its no good having a fast 3-cone time if you can’t get open anyway. Harry is a bad route runner. Harry has the same 3-cone time as Brown. I have Harry at 7.05 and Samuel at 7.03 according to Draft Scout. I take it Grant that you intend to argue the case as to why Harry would be a fine pick for the 49ers? If you do, I will very much disagree. I don’t care what his time was in the 3 cone, he runs poor routes and doesn’t get open unless schemed open. Scooter, I agree with you on Deebo. Again, Kyle is confident in his ability to scheme his WR open, but his scheme is predicated on guys who can get in and out of their breaks efficiently to gain early separation. It’s not a coincidence that Dante Pettis, Trent Taylor, and Richie James Jr., and even George Kittle are all guys who do this consistently. It’s the one constant we’ve seen from all of the receivers he’s drafted. Of course, George Kittle is much more than simply a TE with quick-twitch athletic traits and the ability to gain early separation, but it is certainly one of the many great qualities which make him such a special player. Speaking of TE’s Scooter and Razor, the 49ers could use an upgrade over Celek. Any thoughts about the local kid from SJ State, Josh Oliver? Kyle had a chance to work with the kid at the Senior Bowl, and I really like his fit for the Niners as a 4th round prospect. I just recently did a little homework on the TE prospects and although I’ve had the massive 6’8″ 265 lbs TE prospect out of Mich – Zach Gentry, pegged as a guy who could develop into a beast of a blocking TE and redzone threat, I think round 4 is probably too high for him. Oliver however, really jumped out for me as a guy who fits perfectly for the 49ers. I think he’s probably going to go in the 4th round range, and I currently have him ranked only 1 spot behind Boykin on my current board, so I wonder if he’s an option for the 49ers if they go a different route at WR? I’d be happy if the Niners took a flier on Gentry in round 6, but I like my 2019 sleeper pick, OG/OT Keaton Sutherland out of Texas A&M, with the 49ers last pick. Perhaps Sutherland is on the radar of more teams than I suspect, but whoever ends up selecting this kid at the tail end of the draft, is going to get a versatile OL with the potential to develop into a quality starter at OG, and/or quality backup at OT, IMO, especially if he goes to a team who utilizes a zone blocking scheme. Probably address TE in the 6th with it being such a strong class. Maybe Drew Sample or Isaac Nauta. An elite pass catching tight end in the second, used along with Kittle, would make headaches all day long for D-coordinators. Many schemes could be made such that we could mix/match in such a way that Defenses simply couldn’t defend. Then, pick up that receiver who will assuredly be waived after the draft and before the season begins. At this point, given the pick-up of Mathews, should we not look at another receiver as the cherry on top? Because this “Banana Split” is not quite done, yet…………. If you think they see Matthews as the answer at WR I reckon you are kidding yourself. They hope he can contribute I am sure, but believing he is their starter moving forward? Don’t see it. I’m all for dual pass catching TE’s, but it’d be hard to justify paying one more than Kittle and that’s what they’d have to do if they took one that high. I think there is a hole on our new wide 9 defensive front for Bosa, and a hole at flanker in our offense that need filling. If Ford goes down, who else on the team can provide consistent edge pressure? Nobody. Matthews has his own injury history too, and all we have behind him is Bourne. If Pettis isn’t Garcon’s heir, and Goodwin’s snaps according to Shanny must be reduced, then we have add another outside weapon so Jimmy can hit the ground throwing…. Im just thinking all of these pass-catching running backs are going to pick up any and all slack in the receiving dpt. That, and picking up something in waivers thats pretty decent for the relative short term is probably the way I would go–for whatever thats worth. I suppose a large receiver could do the same……….he doesn’t have to line up in any traditional spot. * Draft Pick #104: After NFL Combine, need to take another look at N.D. WR Miles Boykin. * 4.42s 40, 43.5 vert., 11’8” broad jump, 6.77 3 cone, 4.07 shuttle! * If he is still on the board at pick # 104: I like TE Josh Oliver, S. J. St. Sounds like you and I are on the same page GEEP! It will be interesting to see if the advantage of coaching some of these kids at the senior Bowl will be a factor come draft day? Jebus, really?!! Well, sign me up, he must be good, right? Just like Stephen Hill. No, he wasn’t good. Ok, just like Dorial Green-Beckham then. Oh, wait, no he sucked too. Ok ok, I’ve got it, just like Justin Hunter! Ah, dang it… Jon Baldwin? Chris Conley? Gah! You mean to tell me being an incredible athlete doesn’t make you an awesome WR? FYI, I’m certainly not using Boykin’s combine numbers as some kind of be-all-to-end-all when it comes to his player evaluation Scooter. But his athleticism is certainly a plus in my book, I will say that. More importantly than his combine numbers is the fact that he shows the kind of quick feet and flexible hips that allow him to get in and out of his breaks efficiently, which a lot of these big bodied receivers can’t do particularly well. Once he learns the nuances of the position, and proper stem techniques, I think he’s going to be a fantastic big bodied receiver. He’s going to need to develop those techniques, no question about that, but most of these young receivers are in the same boat coming out of college these days. I think Boykin is a guy who’s size and skill set will allow him to come in and contribute right away, and I think his ceiling is very high, which is exactly what I’m looking for in a 4th round pick. I think we can all agree that the 49ers could use more size at WR, especially in the redzone. Everything depends on what Arizona does. If they pass on a QB, our opportunities change drastically. One very important aspect that I get continually laughed at, is by taking Hakeem Butler and/or Miles Boykin for their blocking ability and downfield assistance to their counterpart WR… or Kittles, or his counterpart at TE likeJosh Oliver from San Jose State. We already have some small speedy receivers, Taylor, Goodwin, and Pettis; now let’s get some ‘BIG, WRs and TEs…. Well, that’s the thing OREGON, I’m looking at players who are no only good football players, but also compliment the players who are already on he 49ers current roster. This is not a developmental season. The 49ers need to compete for the division and a postseason berth this season. Therefor, they need guys who can come in and fill specific roles. They certainly need to go BPA with their round 1 pick, as blue chip players are a different breed, but this a deep draft, and what the 49ers don’t need, IMO, are guys who will come in and beat out players who have already solidified their current roles. I hope the 49ers brass understand this, and I suspect they do. Of course, if there is a player who is clearly BPA on their board, fine, they should probably pull the trigger and draft that player. But I want as complete of a roster as they can build this offseason, and that means drafting players who fill a need. And it’s worth keeping in mind that one of the 49reasons ShanaLynch moved up to draft Dante Pettis as early as they did, is because they believe in his versatility. This is a guy who can be effective lining up anywhere, and that’s a valuable player to have on a roster. To pigeonhole Dante to any one spot, runs counter to the very reason the 49ers moved up in round 2 to draft him in the first place, IMO. Can the 49ers continue to field one of the smallest WR corps in the NFL, and compete for a title? I have my doubts! You’re right on top of why I’m so dead-set on ‘big’ receivers…with Pettis and Goodwin and Taylor plus our receiving backfield, we can relive the days of Rice and Taylor blocking downfield as well as creating separation on their own routes Pettis and Goodwin will open up the middle of the field…. Exactly OREGONINER. Maybe Boykin is that guy, maybe he isn’t … but it’s hard to argue against the notion that the 49ers need more size at WR on the outside, the inside, and in the redzone. We’ve witnessed the limitations of having such a small WR corp across the board, and it’s no wonder they struggle at times in the redzone. I also have a problem with Hakeem Butler’s fit for Kyle’s offense. Sure, he’s big and strong, but he is particularly poor at getting in and out of his breaks, so I highly doubt he’s the kind of big bodied WR Kyle would be looking at. Sorry guys, but I think in between the Jaguars pick and Ravens pick is the range that Brown will get drafted. Remember what happened when they traded up for Foster, Joe Williams, CJB and Pettis. 2 of those players have disappeared, and they should have been patient with the other 2, saved the picks, and still could have drafted them without moving up. Mocks have him going much earlier, so they should just target other, talented WRs. Giants at 17 might want to draft AJ Brown as the replacement for OBJ. Giants at 17 might take Metcalf IF he’s still on the board. Draftek mock draft has Steelers picking AJ Brown as a replacement for AB, and Seahawks taking DK Metcalf. Giants picked Devin Bush at 17 to help fix their defense, after selecting a QB. DK Metcalf is ranked 14th and 15th on CBS and Draftek big boards.Perusing the mock database, Metcalf went from 7 to 26. Hope he does not fall that far, but now they are saying that 5 QBs might be chosen in the first round, so a lot of players may be moved back. The Steelers are drafting Hakeem Butler. Book it. The player they are trying to replace is Martavis Bryant. Not AB. They already have AB’s replacement in JuJu. AJ Brown would just be a second JuJu. They don’t need that, they need a field stretcher. As an interesting aside, Butler is being trained by Calvin Johnson. Calvin Johnson is married to one of the Steelers scouts. That same scout was at Butler’s pro day. Scooter, not that I am one to judge anyone’s sexual preferences, but you made my day with this recent post. BTW, how do you see Hakeem Butler as a prospect? I feel like he one of those players who’s early career success will depend a lot on who drafts him. And he ought to feel fortunate if it’s the Steelers who end up drafting him. I like him a lot. Yes, system fit will be important, but he is a guy I think can be a menace as a downfield threat a la Vincent Jackson. Nope. Ju Ju ran a 4.56 forty, so he is not a blazer like Brown. AB ran 4.47, AJ Brown ran 4.49. Maybe they want Marquise Brown, who did not run due to surgery, but ran a 4.36 forty previously, that shows up on the game film. Hakeem Butler is ranked 23rd, and they pick at 20, so you may be right, but they may go RB with Josh Jacobs from Bama to replace Bell. Then they can pick a speedy WR in the later rounds. Seb, I think you might be putting a little too much stock in how one or two websites have their draft prospects ranked. I guarantee you there are a bunch of teams who’s boards look very different than CBS Sports, as each team has their own set of scouts and executives who have their own way of setting their draft boards and ranking individual prospects, so keep that in mind. 49, sure, that is why I look at a bunch of different Big Boards. I generally use Draftek, but used CBS because AJ Brown was ranked 34, and Keelan Doss was ranked 212, with the Niners picking 212. I also look at the Walter Big Board, although they have Haskins at 26 and Murray at 28. I looked at the NFL Draft Tracker, and they have Jeffery Simmons as the second best player in the draft. Too bad he beat a woman, then tore his ACL. I also look at Mel Kiper, Daniel Jeremiah, Gil Brandt and Matt Miller’s top 100. Yes, I agree, there are wildly diverse draft boards, but then again, the draft is an inexact science. Butler is a much better fit for the Steelers, playing with a big armed QB like big Ben. Butler takes a while to get up to full speed, and is particularly poor getting in and out of his breaks. Heck, I’ve seen the kid trip over his own feet, more than once. He also has lapses in concentration, leading to bouts of the dropsies. But Butler can certainly fly at full speed, and he is a beast when it comes to downfield blocking and producing YAC. Do one of these breakdown columns on Brian Burns. When you have a moment, put together a breakdown of Thanos. The grapevine–out of the Avengers combine–has Thanos at 10’8″, 480lbs, 42″ arms, 15.5″ hands, 100 reps (stopped by officials at 100–what’s the point). Big plus, it’s said he has all the infinity stones. Cassie, Thanos may be superhuman, and have superhuman strength, speed & stamina, but his football IQ seems to be lacking. Even though he’s known to have the power to manipulate matter, I’ve heard he still has hands of stone, and lacks the even the most basic fundamentals of the sport, and because of this, he really struggles to gain separation, and often loses track of the endzone. We know how much Sebnynah loves to references prospect rankings, so I wonder if Seb feels like Thanos is just too big of a draft risk because he doesn’t show up anywhere on CBS Sports list of prospect rankings? I guess only the legend who goes by the screen name Sebnynah, can answer this pressing question leading up to the draft. I for one,will be waiting with baited breath! Personally, I’d rather take a flyer on Spider-man. He may be a little undersized, and require some development, but he seems to have great hands, in fact, he has the kind of hands some would even call “sticky”, and I like that in a WR prospect. Again though, I’m left wondering where Sebnynah would have him ranked, because we know those rankings are everything! Miles Boykin will be the 49ers WR in the 2nd or 3rd. Very good production after ND went with Ian Book at QB. 49ers love ND guys and Boykin is a class guy that put up combine #’s like no other WR. 43.5″ vertical at 6’4″. Didn’t get much of a chance until the Citrus bowl last New Years and made the game winning one handed catch to win vs LSU. He will be a player that grows with additional experience in the NFL. If they don’t get him they’ll regret it within three years. He should be a real good WR. He told his friends he was going to kill it at the combine. A lot of his teammates at a sports club went crazy watching his 4.4- 40. People say 2nd to 5th round, probably late 3rd to late 4th. He still needs to learn and may sit out this season but will still be brought in to play. Yes, he was named the MVP of the 2018 Citrus Bowl and Boykin was just invited by the Patriots the other day to be in their top-30 meetings or private work-outs. NFL teams have a limit of 30 private workouts. He needs some work but Boykin uses his upper body well to release from press coverage. He also is no stranger to working a step outside before cutting back inside to get open in the intermediate range. Boykin works his hands and quickness of the lower body in concert to slip free from defenders at the line. He’s advanced in this area. Boykin is also more than adept at working off coverage too. As a size/speed mismatch, he’s a threat to go over the top on most routes. He shows an understanding of that advantage by keeping corners engaged in a possible deep route before quickly snapping outside on a breaking pattern. Such a move helps him create easy separations and wide windows on the sideline with out-routes. He’s an effortless mover on the field. With plenty of nuance to complement clear athleticism on the field, Boykin will be a serious separation threat at the next level. +1 cliff Moody & Todd. Boykin’s lack of big time production at ND was more about circumstance, than ability. Once he get’s coached up and hones his craft, learns the nuances of the position, develops a full route tree, and learns how to consistently win off of his release (he has the physical talent, he’s just missing some of the nuances of beating man coverage), he should reach his full potential, by my best guess – sometime during his 2nd to 3rd season. He already has the ability to come in and contribute in areas the 49ers are currently lacking, and that’s a big plus for this season. However, once he hits his full potential, he’s going to be that classic – game breaking NFL #1 receiver, who cannot be contained by either bump and run, or zone coverage. I usually don’t like to toot my own horn, but I’m rarely wrong when it comes to identifying WR’s who have a wealth of untapped potential. N’Keal Harry, Parris Campbell, JJ Acega-Whiteside, Kelvin Harmon, Emmanuel Hall, Terry McLaurin, Deebo Samuel. Darius Slayton, Andy Isabella, Miles Boykin and Mecole Hardman are all WRs who the Niners should consider. They all are very speedy, and some have height and size. My mock draft…Don’t pick whoever Razorqueefer likes!Dudes been wring about every single prospect for five years!Yet year after year on here yapping his mouth like some expert ..And year after year he is wrong he is the Trent Baalke of the press Democrat! Razor seems to have missed on his “King” Solomon pick, but he’s been pretty solid up and down the draft, IMO. Nobody hits on every pick, not even myself. I may have been right on Thomas, but I once thought Connor Cook was worthy of a 2nd round pick, and Sebnynah reminds me of this swing-and-a-miss every chance he gets. So even I’m not batting a thousand, not that I’m keeping track. Well …. I am keeping a rough track, but I don’t like to brag. Well … occasionally I’ll brag but I don’t let it go to my head. Well … sometimes it does go to my head, I just usually keep it to myself. Although … sometimes I will point out that my track record is probably above average. Well … maybe well above average, but who’s keeping track. Well … I may be keeping track, but I don’t like to brag. 49, I would not bring that up, but you did not write a blurb, you wrote tomes on Connor Cook. I actually was going to let your latest post pass without comment, but you just had to bring me into the conversation. I hope you point out all my misses, just like I will do with yours. I have been impressed with you. Your brevity is refreshing. Keep up the good work. Mock draft 11, Post Free agency. 2 trade back scenario with Raiders and Broncos, resulting in the Niners ending up with pick numbers 10, 35, 36, 41, 67, 104, 106, 148, 176 and 212.
defender, only had 10.5 sacks in his career in college. he is going to need a ton of coaching to be a great edge defender like many think he is. * His best fit ultimately may still be as a three-technique defensive tackle that can be moved around. * AJ Brown WR: A great WR! But odds of 9ers moving up to drafting him, are at best unlikely. the 9ers may trade down with NYG and draft an OT (Andre Dillard Wash. St.), to replace Staley when he retires. development. No awareness for when he’s stepping into trap blocks. Run fits can feel random at times. timing in work-up blocks. Unable to hit his landmarks on reach blocks and be limited by scheme fit. GEEP, Rashan Gary may have the most upside of all the EDGE players, since he is considered a physical freak, and I think Kocurek can coach him up. Gary played injured last season, so once he is fully healthy, he can demonstrate his full potential. At least he did play through pain, unlike Bosa. AJ Brown was ranked 34 on the CBS Big Board, so picking him at 35 was reasonable. Sporting News top 100 has him ranked 42. Personally, I think he will go around pick 17-26, but I am just going with the draft board rankings.If not Brown, N’Keal Harry might be a good choice. Chris Lindstrom may replace Person. He had very good Senior Bowl practices, and did well in the Combine. He is 6′ 4″ 308 lbs, and ran a 4.91 forty. The biggest weakness on the O line is the interior. His overview states he may help at center, too. C Gardner-Johnson is a better fit as a FS. Thornhill is a good option, too, but he may take bad angles. Germaine Pratt may be that hybrid LB/S, the Niners can use on passing downs.I am hoping Joe Woods can coach him up. With AJ Brown and Keelan Doss, they just drafted 2 WRs. They really need a TE. I also could have gone with Caleb Wilson, but I like Oliver’s toughness making catches in traffic. Oliver is the type of player JL is looking for. Oli Udoh did very well in the Senior Bowl practices. The Niner coaches have made thorough assessments of his skilla. He may need a year sitting and studying behind Staley, but he may be Staley’s replacement for 2020. at 6′ 5″ 323 lbs, he ran a 5.05 forty. McGlinchey is so slow, he did not run a 40 yard dash in the Combine or his pro day. both footwork and his counter move. coaching he may become an EDGE Rusher? Geep, the draft is an inexact science, so every player may be a bust. Gary has all the tools to be a dominant player, and he can set the edge. I also like his run defense. He did not get a lot of sacks because he was schemed wrong for that. Kocurek will hopefully use him properly, that maximizes his skillsets. I think he has way more upside than downside, but obviously you disagree. I have the Niners picking Gary at 10, after trading back and getting 4 additional picks. At 2, Bosa, Allen, Q Williams and Oliver may be superior choices. Well, I was smarter than JL and KS, along with Paraag and the scouts, when I said that they should avoid the red flagged players. They still wasted a pick, trading up for Foster, when he was so draped with red flags, he looked like a semaphore. The same goes for Bosa Nova…he didn’t even finish his Senior year with his team…If we want an edge rusher, why not take the ‘best’ of them…with 17.5 sacks. Allen just stands head and shoulders above the rest. We already have Garrnett warming the bench.from his #1 draft position…we don’t need another…. the multiple trades you presume will happen! If you do 100 mock drafts, you may get one or two right. But remember, even a blind squirrel finds a NUT once in awhile. Geep, it is OK. The Niners traded back in 2017, even obtained 2018 second and third round picks, and still got the player they coveted. I propose mocks to show what is possible. Thinking up a mock is very easy to do, and there are tools to do ones that may mimic what a real draft would do. I will use my last mock before the draft as my prediction. Thankfully, the Niners are advertising the fact they are willing to move back, a draft strategy I advocated before that 2017 draft. In 2018, they were picking 9th, so I did not think they would get a fair deal, or garner enough picks, so I did not advocate a trade back, then. In 2017, posters were deriding the very idea that a trade back was even possible. Now, many on this site think a trade back will help in the rebuild, even if the Niners miss out on Bosa and Allen. Getting additional second and third round picks will allow the Niners to tap into the sweet spot of the draft. * “Thinking up a mock is very easy to do.” Yes, and your plethora of mock drafts prove it. * Try using that thing on your shoulders for something other than a hat rack? GEEP, are you mocking mocks? Maybe you should do one to impress me. You do not even have to trade back, but I will think my mock is superior with 10 picks, instead of yours with only 6 picks. Razor has a app, I like Fanspeak. Takes less than 10 minutes. 2019 draft, it’s a different year and different players…..Like apples and oranges! they should, can or will. and trade for a player he wants! want to trade draft picks for. Sure, it takes 2 to tango, but in the history of the league, many many times, QB needy teams will move up to select the QB they covet. I am not looking for a Goff or Wentz draft haul, with multiple first round picks and 6 and 7 picks overall. My trade backs allow the teams to keep their other first round picks, so they are fair and reasonable, making it a win/win for both sides. I have identified the Raiders and Giants as teams that may want to move up. Denver may also want to move up, because Flacco is not a long term solution. While I hunger for another ’86 draft, I am not advocating that the Niners trade out of the first round. JL does not have a red button, but he managed to trade back, garner picks, and still get the player he coveted. You may think he is incompetent, but I think he is smart enough, and can repeat his past performance. I wonder why Gary is ranked 4, and Winovich is ranked 89, on the Sporting News draft big board. * Don’t want to speak for Jack, but just for your edification….He did NOT say what round, did he? * As you love to pontificate…..Reading comprehension is imperative! * Any blind squirrels find you today? GEEP, I want the Niners to draft an EDGE in the first round. Maybe I was implying that drafting Winovich in the first round may be reaching too far back. A lot of times, Gary seemed to occupy multiple blockers, so Winovich could come in clean. Still am wondering why Winovich is so good, but is ranked 89 by the experts. Some think he may be more of a showboat, and less of a team player. JL should avoid players like that. Thanks for the read, bud. I am really looking forward to Street’ performance in TC. We may already have a good Dline player in Street without having to spend a draft pick and draft capital on another player. Thanks. I have no idea what the plan is for Street. In college he played both inside and on the edge. However, his NFL profile has him at 6’2″ and 287 lbs, which I would have to think was coming out of college. If he has now “bulked up”, then it would seem that the plan is to play him inside. Since this would seem to further support the idea that this is Armstead’s last season with the team, I hope we can trade Armstead in some way (straightup, with draft picks, etc.). Assuming we get Bosa, if AJ Brown is still on the board when the Patriots are on the clock; what do you think about offering our 2nd round pick +Arik Armstead for their 32nd, and get AJ Brown? No, no, no. The Niners should not help the Pats win another SB. With Gronk retiring, I thought they would originally go for Isabella/ Brown, but now think they go for a TE. I think they could use another yearly rental for Flowers, and can get a receiver later on. #32 and WR A. J. Brown, then sign FA safety Tre Boston. Roll the rest of ~$16 mil Salary Cap saving to 2020. I agree with The Game host, Grant. Grab the Stud at #2, and don’t settle for a couple geldings by trading down. Took Kolton Miller and thought he was Mike McGlinchey! LOL! That was rich! I think all the trade back talks are convincing the Giants that they need to move up to ensure they get Haskins, the QB they covet. Raiders are still in the running for Haskins, and a mock for TB had them taking Haskins at 5. Giants could trade their 2 firsts and two 5ths, and it would add up on the TVC, but I think they will want to keep that 17th pick. Giants could offer their first, second 4th and 5th round picks ( 6, 37, 132, 143), plus a 2020 second round pick to balance out the TVC. If the Giants finish 17th this season, it would balance out. The Niners would recoup the second round pick they traded away for Dee Ford. The Niners would end up with pick numbers 6, 36, 37, 67, 104, 132, 143, 176 and 212, along with the Giants 2020 second round pick. It would be fair for both teams because the Niners would get 4 additional picks for moving back 4 spots. The Giants would get the QB they covet, and keep the 17th pick. With Murray and Haskins going 1-2, with Bosa, Allen, Q Williams, Oliver, Sweat and Gary available, the Niners could pick from at least 2 of those remaining players. subscribe to Tarot Card readings and Voodoo? I took a clone from my Cinderella 99 mother, and pollinated it with a male Blue Glue. I call it, Blues Brothers. Yea, it’s been my favorite strain for the past 15 years. Delicious, heady and finishes budding in 50 days flat. Brothers Grimm are the proprietors…. Just for laughs, lets see you make a mock draft out of the Niner picks. Maybe for even bigger laughs, lets see you devise a mock out of pick numbers 6, 36, 37, 67, 104, 132, 143, 176 and 212. However, you are probably too timid to be bold and decisive. I see you can criticize like crazy, but are too afraid to even venture a mock. Anyone else see this as an appropriate blueprint for the 49ers draft? Trade back, get another second round pick, and select an interior lineman. Or trade back twice, then get a Flanker, FS, and G/C, in the second round. We won’t be drafting an OL high, because Shanny said he doesn’t plan on changing the starting lineup. He also said that Coleman gives them competition for the swing position. Also, Maiocco said Staley plans to play 2 more years. It’ll be a late round developmental prospect…. I would add that the plan according to Maiocco is indeed for McGlinchey to assume the LT duties in 2 years. I beg to differ. JG may become injured, if they allow so much pressure up the middle. I have little confidence in Garnett, but maybe they will play him in his position of strength, and he does well. Person is just a Person. I am hoping Richberg will be better with his injury healed, but both Guards need upgrading. Getting a solid O line will help in the run game, and the passing game. They did not grade out well last season. I’m just giving you the facts from what the head coach said, and the beat reporter they are closest with reported. Your contention comes as no surprise given your legendary status. Maybe after reading this, you change their minds but until then; OL is a late day 3 developmental prospect…. I agree OL needs help and don’t believe every word JS says right now, it’s the season for hype. I hope they don’t kick the can down the road for OL which I think is a big mistake and hope Staley plays good for 2 years and all that. Or they pick OL in the 6th rd. I agree the OG’s, Garnett and Richberg aren’t very good and JG needs a more solid OL for the running game, passing game and Jimmy’s health. Maybe they trade down picking up an extra 1st rd pick or trade down from #36, still get a 2nd rd pick plus another 3rd rd pick. Get another “solid” piece every year like they did w/McG and the Colts did w/Nelson. Every best laid plans may need some modifications. Yes, I am assuming there are willing trade up partners, and yes, they may be forced to select all 6 picks at their assigned places. Still think the guard position is weak, and this draft has some good guards. With the Ward and Exum signing, and Colbert and Tartt returning, safety is not as high a priority to me. Moore, DJ Reed and Marcell Harris give even more depth. Sure, KS had a plan, but he traded up for Foster, CJB, Joe Williams and Pettis, so I am not in awe of his player assessments. I am actually thinking they won’t add a FS, but will add a CB instead. Then move Moore back to FS. They have been taking a look at some mid-round CBs but I still haven’t seen anything linking them to a FS outside of the Senior Bowl. So unless they are locked on to a guy they love and don’t want to tip their hand, I am of the opinion that FS won’t be a priority. The addition of Joe Woods and then Verrett may be an indicator they intend to move away from their prototype at CB, which is part of the reason why I think Moore may be moved back to his more natural position. Scooter, why would they have wasted a year trying to convert him to corner if they planned on playing him at FS? If that’s the case, they’ll need to take one on day 2 and the earlier the better, because this cb class isn’t very good. * What’s your opinion of Virginia safety Juan Thornhill, who has / can also played CB? Excellent player, GEEP. He is who I would take at #36. Get the WR in round 3 (Riley Ridley). But I am doubting the 49ers will go this route. I am somewhat baffled that we’re (to this point) still holding onto DJ Reed, and Derek Celek ? It seems that other than Celek’s one game per season, their most notable accomplishments have been going on IR….Reed is undersized, and Celek stands around too much…. * 9ers need to draft an OT to replace J Staley when he retires in a year or two. * Draft pick #104: Small school sleeper, Tytus Howard, OT, Alabama St.
Yea, I like Pipkins in the 6th round. Yup, timid and fearful. Too afraid of actually presenting a mock. What a profile in cowardice. If you had done one elsewhere, just cut and paste it here. Now, you seem lazy, too. Gosh, I did not know that you know absolutely nothing about blog etiquette. If you want to criticize, do not throw stones then cower. Guess you like to dish it out, but sure cannot take it. Believe it or not, in this last few weeks before the draft, posters will be presenting their mocks. I think it is perfectly fine to ask for a mock from you, since you want to slice and dice mine. Now you are using caps and denigrating hard work, attacking me with my own words. Maybe you should have gone all the way and say you do not like blustering, belligerent, bellicose, bloviating, bombastic , blubbering buffoons. Back at ya. With you, I do not need to try at all. I wonder if you will descend into expletives, soon. * “Now you are using caps and denigrating hard work, attacking me with my own words. Maybe you should have gone all the way and say you do not like blustering, belligerent, bellicose, bloviating, bombastic , blubbering buffoons.” Did I hit a nerve Seb? every other comment on the blog? GEEP, get a clue. Stop addressing me, and we can all live happily ever after. But no, like a moth to a flame…….You cannot help yourself. Why do I comment a lot? Grant sure does mind the number, and I generally just stick to football. This is the off season, but the draft is looming, and here is when everyone gets to play GM. I advocated trading back for years, so when I hear JL say he is amenable to a trade back, that is music to my ears. Your pushback just means you take my comments way too seriously. Be like others, and find the humor in them. * LMAO; Got you a little disconcerted Seb, or Grant’s wooden boy pinocchio? * How about Prime? Is he real, or just another figment of your delusional imagination? Grant wants as many comments as possible, not as few as possible. Believe it or not, he likes it when there are lots of comments. Most blog sites do. Hmmm, you have been obnoxious, and have thrown out the personal attacks, but you are not in the same league as Prime. Glad he is gone, this site is way more civil. I really do not consider you much of a threat, so you will see that I will try to just throw your own words (and Mine) back in your face. 49ers have sold two seats in their draft room for $22,000 (not sure if that is each or together). If my hunch is right, Brotha Tuna and the Duchess. Ha! I miss Bro T.